The proceedings included a keynote speech by U of R trustee Charles Wilke ’64, founding principal of Meridian Capital LLC. “Today is about celebrating your accomplishments,” he said to the graduates, most of whom had held full-time jobs while taking classes at night. 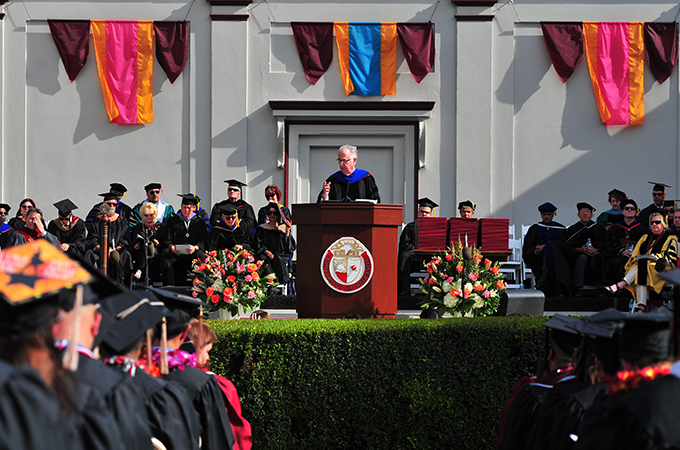 He went on to urge members of the graduating class to bring a commitment to excellence, community, and a culture of transparency, authenticity, and integrity back to their jobs and forward in their careers. I have a confession to make—I have never considered myself or my story to be anything other than ordinary. Yes, I said ordinary. “Of common quality, rank, or ability.” Let that word, which I just used to describe myself, sink in for a moment. But I imagine that some of you can relate, right? I started my journey in higher education 27 years ago. Yes, I recognize that’s before a few of you were even born. It was 1991, and I had big dreams of how I thought my life would turn out. But life doesn’t always end up how we imagined. And for me, I’m so glad it didn’t. During my second year of college, I was blessed with an amazing gift – my son. I missed one week of classes to deliver him, then I was back at it. As a single mom, I spent the next two years as a full-time student and working a full-time job that barely made ends meet. I was doing everything I possibly could to stay afloat, but finally, it became too much. Six classes shy of completing my bachelor’s degree, I decided to take a temporary break from school that turned into 20 years. I refined my mom skills, got married, started a business, gave birth to our daughter, and lived an ordinary life. But I always had this nagging urge to finish what I started. I wanted career and life opportunities that were more than just ordinary. After all, what was I modeling for my children – that when life gets hard, you quit and settle? I don’t know about you, but that’s not a lesson I want to be teaching anyone. When I decided to return to the workforce four years ago, every job posting I saw required a degree. I cried to my husband that no one would ever hire me for a higher-level job because I never finished college. I accepted the first job I was offered, barely squeaking in because a degree was not required. They took a huge risk in hiring me, so I worked hard, beyond what was expected. When a position opened in my department, one of my supervisors asked me to apply. But, without a degree I didn’t meet the minimum qualifications, a position I know many of you have faced. What he said next on that ordinary day in my ordinary life would send me down the not-so-ordinary path that led me here today. He told me that I had the right skills and with my degree I would be a great candidate for a future promotion. He instilled a confidence in me that I had lost during the last 20 ordinary years. I researched how I could complete my degree and my advisor mapped out an 18-month program. Halfway through, I missed yet another promotion because of … you guessed it … no degree. Last summer, I finally got that degree and immediately began my MBA. After over two decades of living under the veil of ordinary, I was starting to see into the extraordinary. Along this journey, I’ve had the most incredible support. My husband has carried much of the load at home while I’ve been buried in books. Our daughter has been flexible and understanding. My family has encouraged me and helped whenever necessary. My supervisors and co-workers have been some of my biggest cheerleaders. They supported and encouraged me to study abroad not just once, but three times. This former single mom, full-time working, full-time studying, ordinary girl from Southern California who had never left the country made it all the way to the Krakow Technology Park, an NGO school in a Cambodian village, and in a couple of months to Iceland. Where else could I have the opportunity to take 20 years off from school, have a family, work full-time, earn two degrees, learn in nine different countries, and after waiting so long, finally get that promotion? Only in Redlands can that kind of extraordinary happen. Here’s the most important lesson I’ve learned as a Bulldog—besides how to write a perfectly formatted APA paper—I am far from ordinary, and so are you. Each of us has our own story and big dreams. Some feel ordinary and some don’t know how to feel at all. But together we put portions of our lives on hold; we missed job opportunities; we laughed; we mourned; we supported and learned from each other; we forged friendships and had experiences that we could never have imagined. If you remember nothing else, remember this. We all passed far beyond the ordinary to become extraordinary. We finished what we started, and we persevered through the obstacles that got in our way. We, the Class of 2018, are the next extraordinary leaders of the 21st century. Congratulations to all of us, and Och Tamale! 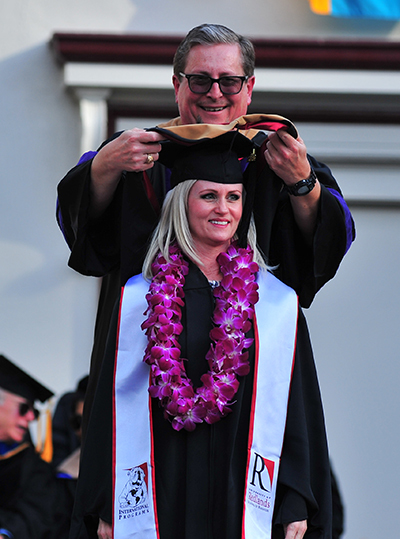 Members of the graduating class hailed from seven of the University’s regional campuses throughout Southern California, as well as corporate training sites for Caltech, Jet Propulsion Laboratory, and United Technologies Corporation. Of those graduating, 33 were international students from 14 countries, and 102 were military veterans from five branches of the armed forces. 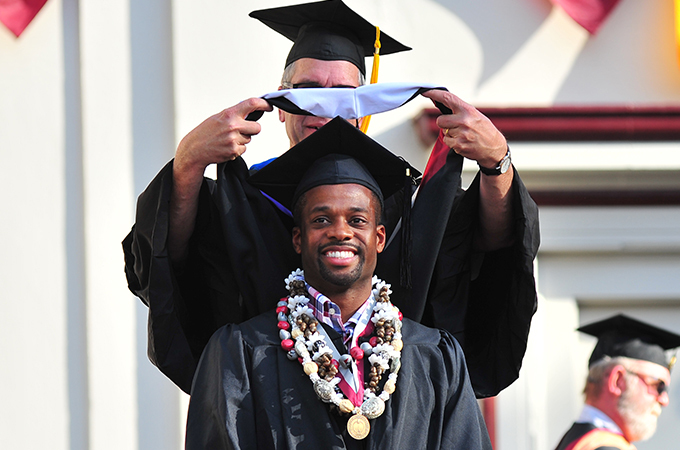 For some, the University of Redlands had become a family affair—77 of the graduates had relatives who had attended the University. The class also included two married couples and seven sets of siblings. A video of the School of Business commencement is available online, as is more information about the School of Business and its programs.